Blue Jays manager Cito Gaston has spent the last few months telling every reporter who asks him that he really, truly and honestly won’t miss much when this season ends and he retires from baseball. Nope. Once he retires he’ll see the world on his own time instead of packing a suitcase every three days and jetting to a new city. Not quite. Managing is exciting but watching baseball can get dull. Besides, every hour at the ballpark is an hour not spent playing golf. Gaston says he won’t even miss landmarks like Fenway Park, where the visiting team’s cramped quarters inspire more claustrophobia than nostalgia. Heading into his final home game as Jays’ manager, Gaston continued to portray himself as too cool to care, admitting that he might cry but not dwelling on the question during the pre-game media briefing. But as he watched a video tribute to his career during a pre-game farewell ceremony, a single tear streaked his right cheek. And as Gaston finally addressed the Rogers Centre crowd another tear spilled from his right eye, even as his voice held steady. The 66-year-old manager may not be sentimental, but he certainly is human. You can’t, and the emotion of the pre-game ceremony bled into the game. Leadoff batter and left fielder Travis Snider stepped to the plate in the first inning with eye-black on his upper lip, his tribute to Gaston’s moustache. And then he gave Gaston a gift a hitting coach-turned-manager could truly appreciate — a home run to the right-field seats. Snider’s 13th home run of the season was the Jays’ 245th, breaking a club record established a decade ago and burnishing Gaston’s reputation as a manager who makes good hitters better. A home run record was one of several official and unofficial tributes to Gaston at the Rogers Centre Wednesday. 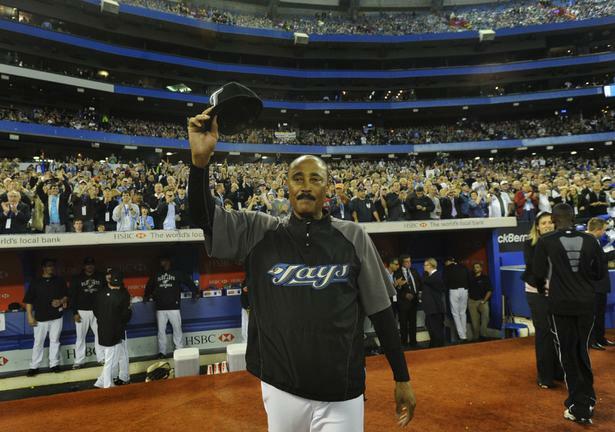 A fan in right field hung up a sign that featured a painting of the manager and the words “Cito Gaston Legend,” while other fans showed up in Cito Gaston masks. Fans showed up, period. The 33,143 at Gaston’s farewell formed the largest Blue Jays home crowd since the Yankees visited in June, pushing the Jays to play with post-season intensity. What Gaston means to baseball overall remains an open question as he enters the final series of his managerial career. Between 1989, when he was promoted to manager after 56 games, and 1993, Gaston guided the Jays to four division titles and two World Series championships. Couple that with his trailblazing status as the only African-American manager to win a World Series and Reds manager Dusty Baker says Gaston deserves a spot in the hall of fame. Baker says Gaston’s 11-year absence from managing skews his stats and obscures his Cooperstown credentials. After Wednesday’s game, Gaston said he hadn’t devoted much thought to his legacy, only that he hoped people would remember him as a manager who treated players fairly. But after a season of stressing a clean break from the game, Gaston, who will remain with the Jays as a consultant, had pinpointed what he will miss about the job.